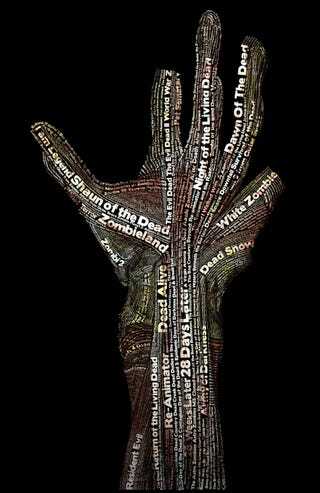 This poster, by Freaking Awesome, contains the title of 978 pieces of zombie fiction, arranged, Left 4 Dead-style, in the shape of a flesh-biter's hand. Can you spot the video games among them? It's not hard. They're mostly in one spot, and while it won't be comprehensive, they've done a pretty good job, including games from series like OneChanbara alongside more well-known franchises like Resident Evil. You can find purchasing info at the link below, if you're interested.